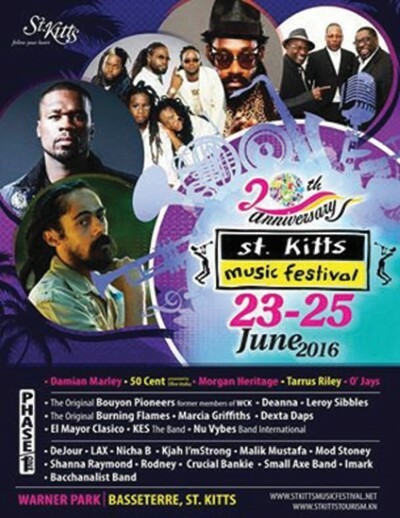 A large number of well-known regional and international musicians are slated to perform during the June 23-25 stating of the 20th annual St. Kitts Music Festival at the Warner Park Football Stadium. The festival will be the biggest musical event held in the Federation. Featured performers will be: Morgan Heritage, The Original Bouyon, Deanna, Leroy Sibbles, The Original Burning Flames, Marcia Griffiths, Dexta Daps, El Mayor Clasico and Kes The Band. Additional musicians will include: popular American rapper Curtis James Jackson III (50 cent); Jamaican Reggae powerhouses Tarrus Riley and Damian ‘Jr. Gong’ Marley; and R&B group O’ Jays. Tarrus Riley known for slow catchy love songs including, ‘Gimme Likkle One Drop’ and ‘She’s Royal’ is no stranger to Music Festival, as he last appeared at the event in 2014. Curtis James Jackson III aka (50 cent) is a household name in the region, with the popular song, ‘Candy shop.’ He is currently locked in a Court battle over a bankruptcy case. Minister of Tourism, the Hon. Lindsay Grant, speaking at the launching on Friday (April 8) at Palm Court Gardens, explained the festival, which started out as a simple idea, has blossomed into an unmatched event. He pointed out that over its lifetime the festival has stayed true its mode of entertainment and vision of being a truly unique event. Grant noted when the festival began in 1996 St. Kitts entered unfamiliar territory and the committee members were strangers to staging such a concept initiative. “However, the members of the organizing committee believed they were capable and empowered to rise to the occasion. To date it has grown into one of the most renowned events in the region,” Grant explained. “Now, 20 years later, the St. Kitts Music Festival is an annual premier event on the worldwide calendar,” Grant stressed.